7.1Please write to me and send me some photos! 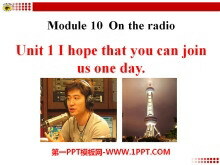 7.2Fill out our form and come to learn English in Los Angeles! 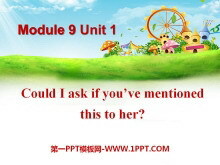 9.1Could I ask if you've mentioned this to her? 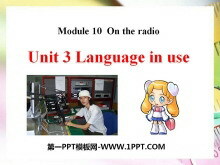 《Language in use》On the radio PPT课件2 Revision Language practice I hope that you can join us one day. When it's on it means we're on air. It seemed that they were speaking to me in person. 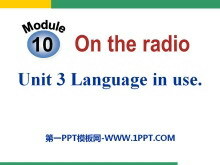 Just tell me what ..
《Language in use》On the radio PPT课件 Teaching aims To summarise and practise the use of object clause and new vocabulary To be able to make a radio programme Language practice I hope that you can join us ..
《It seemed that they were speaking to me in person》On the radio PPT课件 Warming up Is there a radio station at your school? When does the radio station start working? What kind of programme do you like best? 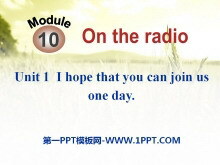 ..
《I hope that you can join us one day》On the radio PPT课件 Warming-up Do you like listening to the radio programmes? What kind of programs do you like? 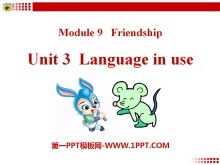 I like watching/listening to I dont like/hate watching/li..
《Language in use》Friendship PPT课件2 Language practice I know (that) foreigners find China very different from their own countries. I dont know who will come. Ive heard that you play in the school orchestra. 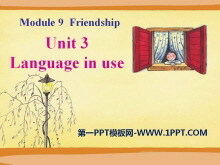 ..
《Language in use》Friendship PPT课件 Revision Language practice Could you explain what happened then? Can you tell me how shes different? Could I ask if youve mentioned this to her? 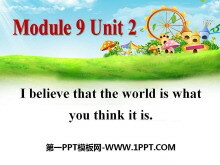 Do you know why she treats ..
《I believe that the world is what you think it is》Friendship PPT课件3 Warming up Are you happy to have many friends? Are you afraid to make friends? Do you often smile at others? 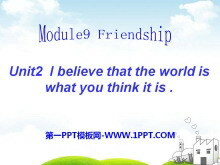 How do you feel when you are ..
《I believe that the world is what you think it is》Friendship PPT课件2 We have own friends and can form the close friendships. Are you happy with your friends ? Are you afraid to make friends with anyone ? 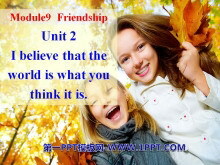 Do ..
《I believe that the world is what you think it is》Friendship PPT课件 Friendship Quotations True friends are hard to find difficult to leave and impossible to forget. 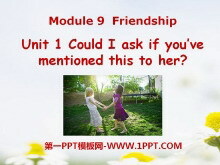 ---Amanda Kunkle True friendship is bas..
《Could I ask if you've mentioned this to her?》Friendship PPT课件2 Words review helpline n. 服务热线 separate v. 使分开，分隔 adj. 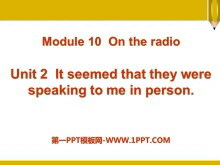 分开的，单独的 explain v. 解释，说明 mention v. 提及，说明 refuse v. 拒绝 trea..
《Could I ask if you've mentioned this to her?》Friendship PPT课件 Free talk Talking about friends: Do you have any friends? Who is your best friend? Where is your best friend from? What does he / she like? Do ..